The spread at May Kaidee. As we've mentioned before, Thai cuisine, in general, is very vegan friendly. While today's version found in the States have been geared to a more meat-centric cuisine, at its core, Thai cuisine is rooted in spices and vegetables. In fact, most Thai restaurants (in LA or New York) usually offer tofu as a substitute for animal meat and most dishes are traditionally prepared using coconut milk, instead of dairy. The only ingredients that are usually an issue are fish sauce and oyster sauce, just because sometimes they don't even mention those in the menu and some dishes are prepared with those ingredients and are hard to take out. With this in mind, we were fairly confident that our food choices in Bangkok would be a breeze. And, besides the fact that we needed to get used to the culture and adjust to the language barrier, it was actually easy to find vegan food in Thailand. While we would have loved to hit up every single vegan restaurant in the city, we only had three days to experience Bangkok. But because we're a couple who loves to eat, we made sure food was one of our top priorities. Check out our list below to see where we ended up eating! "Authentic Thai cuisine located in the back alleys of Bangkok." While they do have several locations all over the world (they have one right here in New York), the one that we ended up going to was in the city's Tanao district. We were pretty much starving right after we landed so we chose to go to this spot since it was close to our hostel. The food, as you can probably tell from the photo, was incredibly fresh and of course, delicious. Besides that, it was amazingly cheap (compared to US standards) that we ended up getting more food that we could eat. The food was also served by the sweetest elderly woman, who, even though she didn't speak English, reminded me of my grandmother. I guess it also helped that the restaurant felt a lot like somebody's house and they just happen to serve amazing vegan food. If you're looking for authentic home-cooked Thai dishes, this is the place for you. Good to know: this particular outpost also offers morning and afternoon vegan cooking classes. check their website to reserve your spot. "Vegan/vegetarian Pan-Asian and American cuisine in a unique and moody atmosphere." Ethos feels like one of those places where you either love it or you hate it. We actually went to this spot twice (once for dinner and the other time for breakfast) and both times were filled with vegetarian/vegan tourists and foreigners. This location was also close to Khaosan Road, which is a popular tourist attraction in the area (not very vegan friendly to say the least) which is probably why the restaurant drew so many out-of-towners. While the restaurant prides itself in using non-GMO ingredients and unrefined sugars, the taste, especially for more of the "Western"-inspired dishes, fell flat. I ordered the burger and Dusty had the spaghetti and both didn't quite meet our expectations. (We did, however, fill ourselves with their uber crispy spring rolls and tasty fried rice.) It was unfortunate because we really loved the decor and the ambience inside the restaurant. We also like the fact that they have very accommodating hours, especially since there weren't any other restaurants offering vegan food that were open so early in the morning. "100% vegan bakery and cafe serving American classics with a Thai flair." This has got to be, hands down, our favorite spot in Bangkok. 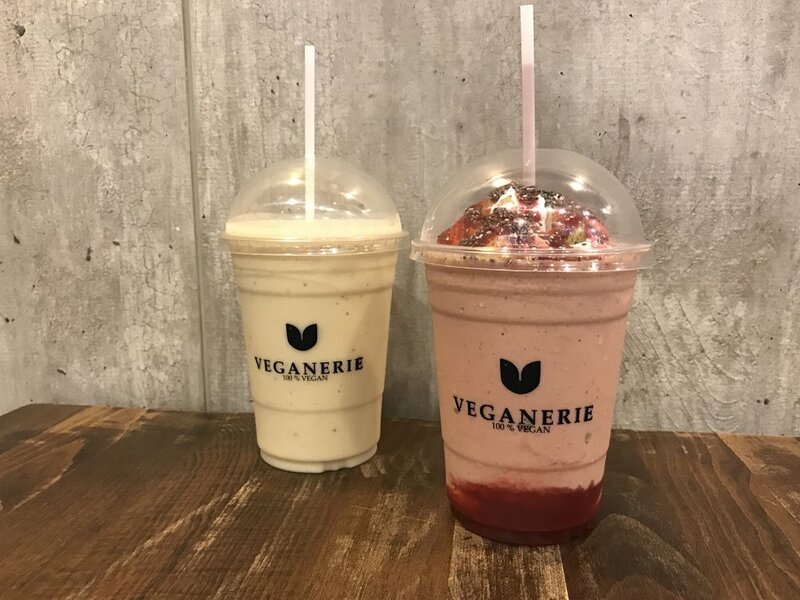 While we didn't get to try all of the vegan restaurants in the city (May Veggie Home, we see you), Veganerie filled the void that we didn't even knew we had. First of all, their menu is insane. If you're a vegan with a sweet tooth, this place has you covered. From sundaes and parfaits to donuts and pizookies, the dessert menu in Veganerie leaves all other dessert places to shame. What's more, they recently started serving main dishes like wraps, burgers, and pastas, all of which were also insanely delicious. I ordered the chicken and waffles with THE BEST VEGAN BACON I've ever tasted. It was so good, I ordered two more dishes to go that had the bacon in it. Amazing. The only downside from this casual cafe is that they don't have a location in the United States, otherwise I would have gone there already. pro tip: this is one of those places that serve great food that you can take to go. we ordered a couple of the wraps to go for our plane flight back home and it held up really well. "Bold and inventive take on classic Thai dishes in a beautiful space." If you're looking for a more upscale place for an elegant night out, look no further than Bo.lan. 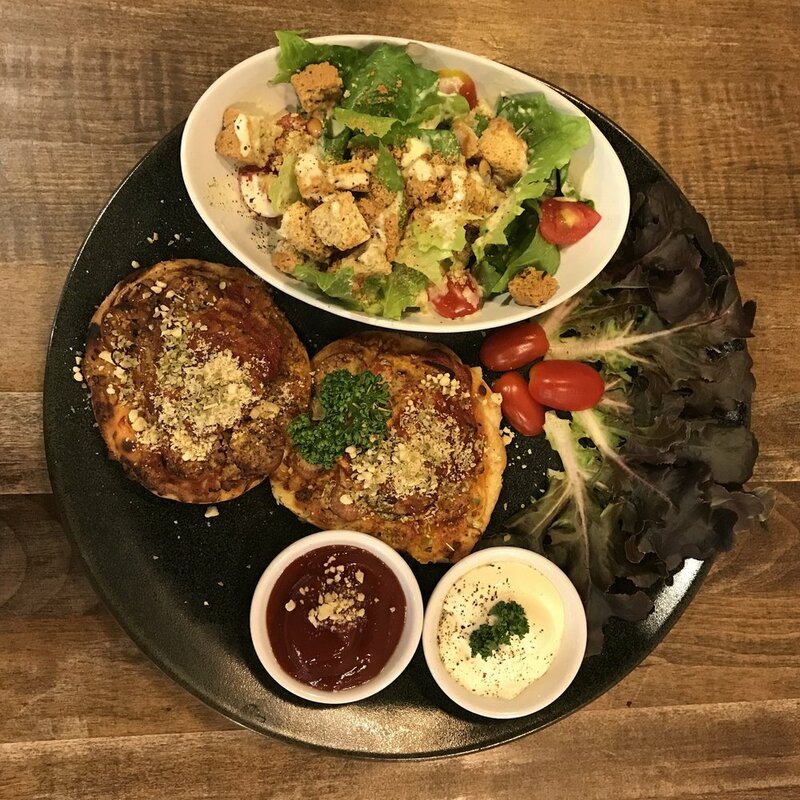 Situated in the more affluent part of Bangkok, this restaurant is tucked in a nondescript street that few taxi drivers know how to go, as evident by our experience in getting to this restaurant. This is definitely a place worth checking out if you're in the mood for something a little nicer than the traditional food stalls or vegan restaurants along the city. Make sure to opt for the Bo.lan Botanicals menu, which is the all vegan part of the menu. Be warned though when doing one of their Prix Fixe menus as they tend to run long. (We actually spent a good three hours in this restaurant alone.) But, at the end of the day, the food was definitely worth trying as it highlights the very best Thai cuisine has to offer. tip: make sure to book a table well in advance to your trip as this place is popular and gets booked a month ahead of time. "A hangout spot for hipsters and local artists alike." We're definitely suckers for aesthetics and Broccoli Revolution has a very Brooklyn hipster cafe vibe that we felt right at home in. While we're not huge fans of the name, we are definitely fans of the food. Broccoli Revolution is a restaurant and cold-pressed juice bar that serves dishes centered around locally grown organic fruits and vegetables. While the menu is not as extensive as we would like, they do offer familiar dishes that hold up on their own and are a welcome change to the more traditional Thai restaurants that we visited. The cafe also serves as a space for local artists to show some of their art pieces and the friendly staff made us feel as if we were in any Williamsburg coffee shop. "A sit-down restaurant featuring exclusive menu items"
Let's be honest: this is really more of another way for me to say how much I love the Veganerie chain. If you didn't believe me before, I'll gladly say it again. The food in Veganerie is incredible. It definitely rivals some of the restaurants here stateside. It is so good that I'm actually getting hungry just writing this post. In fact, I am this close to starting a petition to have a location open in Brooklyn, just so I can have their food every single day. No wonder they have the balls to call themselves the Best Vegan Restaurant in Bangkok. It very well could be. If I do have to nitpick, I would have to say that the restaurant could use some more decor to balance with how good their food is and adding alcohol/liquor to the menu will just take the restaurant concept to a whole new level. Besides that, if you ever find yourself in Bangkok, be sure to check out any one of their four locations. We promise you, you won't regret it. Have you been to any of the above restaurants? Do you agree/disagree with any of our reviews? Or do you just have restaurants that you think we should've mentioned but didn't? Sound off in the comments section! We'd love to hear what you think!